This is second amendment made by Ministry, and will come into effect from the date of its publication in official gazette. in sub rule(6), the word and commas, “which shall be in India” shall be omitted. (b) in clause (iv), for the words “consideration of accounts”, the words “consideration of financial statement including consolidated financial statement, if any, to be approved by the Board under sub-section (1) of section 134 of the Act” shall be substituted. Explanation- it is hereby clarified that the limits specified in sub clauses (i) to (iv) shall apply for transaction or transactions to be entered into either individually or taken together with the previous transactions during a financial year. (c)Is for remuneration for underwriting the subscription of any securities or derivatives thereof, of the company exceeding 1% of the net worth as mentioned in clause (g) of sub section (1) of section 188. The turnover or net worth referred in the above sub rules shall be computed on the basis of the Audited Financial statement of the preceding Financial year. In case of a wholly owned subsidiary, the special resolution passed by the holding company shall be sufficient for the purpose of entering into the transactions between the wholly owned subsidiary and the holding company. IS SECRETARIAL AUDIT MANDATORY FOR FINANCIAL YEAR 2013-14 ? ‘Secretarial Audit’ has introduced by recently enacted Companies Act, 2013. It is compliance audit, by independent practicing company secretary. The purpose is to detect the non-compliances by companies under Companies Act 2013 and other allied Laws as applicable to the companies. TO WHICH COMPANIES SECRETARIAL AUDIT IS MANDATORY? (3) (b) Every public company having a turnover of Two Hundred Fifty Crore rupees or more. WHO CAN BE APPOINTED AS SECRETARIAL AUDITOR? Only a practicing company secretary be appointed as Secretarial Auditor of the Company. vi. Secretarial Standards issued by The Institute of Company Secretaries of India. Thus the scope of Secretarial audit is not limited to the corporate laws applicable to company but it extent to all laws applicable to Company. IS SECRETARIAL AUDIT MANDATORY FOR FINANCIAL YEAR 2013-14? The secretarial audit report shall annex with its Board’s report made in terms of sub-section (3) of section 134, of the Companies Act, 2013. Ministry of Corporate Affairs, vide its circular No. 08/2014, dated 4th April 2014, has clarified that Board Report of the Company relating to financial year that commenced before 1st April 2014, shall be made in accordance with the relevant provisions of the Companies Act, 1956. As the secretarial audit report is an annexure to Board’ Report thus the secretarial audit is not mandatory for financial year ended on 31st March 2014. Moreover as per sub section (15) of section 143 of the Companies Act, 2013, if a secretarial auditor, has reason to believe that an offense involving fraud is being or has been committed against the company by officers or employees of the company, he shall immediately report the matter to the Central Government within such time and in such manner as may be prescribed. Failure to do so shall attract a fine which shall not be less than 1 lakh rupees but which may extend to 25 lakh rupees. General meetings of companies are held at their registered offices and it is not possible for every member specially a members holding minor shares to travel upto the registered office of the company and participate in the general meeting of the company. To eliminate this type of difficulty and to enhance the participation of minority members, concept of e-voting has been introduced by the Companies Act 2013. Now a member can cast his vote easily through his laptop or tablet or PC without physically attending the general meeting. E-voting do not eliminate members right to physically attend and vote at the general meeting however member can cast his vote through one mode only. A member after casting his vote through e-voting can go and attend the general meeting but cannot cast vote in that general meeting. WHICH COMPANIES NEED TO PROVIDE E-VOTING FACILITY? As per section 108 read with rule 20 of the ‘Companies (Management and Administration) Rules, 2014’ following companies need to provide e-voting facility to their members to vote at general meetings. MCA vide its circular No. 20/2014, dated 17th June 2014, has clarified that the due to some practical difficulties the e-voting would not be mandatory till 31st Dec. 2014. However SEBI has clarified that listed companies shall have to provide e-voting facility to its members for all resolutions in general meetings. Following are some of companies who are providing e-voting facility at their ensuing general meetings. b) The agency will issue User- id’s and passwords having the maker , checker and scrutinizer privileges. d) The company can then upload the Register of Members (ROM) , which contains the details of the security holders holding the securities in physical and demat mode across both depositories, as on the record date in the specified format . e) Agency will then generate the password for security holders and forward the same to the Company / RTA. f) The company will then communicate the password, EVSN and the procedure for e-Voting, along with the notice of the resolution to all the security holders. g) The security holders should log on to website of agency during the duration of the Postal Ballot and cast their votes for all the resolutions on the e-Voting System. i) Security holder wise details of the voting done in a report along with a summary , for the records of the company. The company desiring to offer e-voting facility to its members first takes e-voting platform of any one of the e-voting service providers. The notice shall also be placed on the website of the company and website of the agency. The notice of the meeting shall clearly mention that the business may be transacted through electronic voting system and the company is providing facility for voting by electronic means. The notice shall clearly indicate the process and manner for voting by electronic means and the time schedule including the time period during which the votes may be cast and shall also provide the login ID and create a facility for generating password and for keeping security and casting of vote in a secure manner. The e-voting shall remain open for not less than one day and not more than three days. Provided that in all such cases, such voting period shall be completed three days prior to the date of the general meeting. During the e-voting period, shareholders of the company, holding shares either in physical form or in dematerialized form, as on the record date, may cast their vote electronically. Once the vote on a resolution is cast by the shareholder, he shall not be allowed to change it subsequently. At the end of the voting period, the portal where votes are cast shall forthwith be blocked. The scrutinizer shall, within a period of not exceeding three working days from the date of conclusion of e-voting period, unblock the votes in the presence of at least two witnesses not in the employment of the company and make a scrutinizer’s report of the votes cast in favour or against, if any, forthwith to the Chairman. The scrutinizer shall maintain a register either manually or electronically to record the assent or dissent, received, mentioning the particulars of name, address, folio number or client ID of the shareholders, number of shares held by them, nominal value of such shares and whether the shares have differential voting rights. The register and all other papers relating to electronic voting shall remain in the safe custody of the scrutinizer until the chairman considers, approves and signs the minutes and thereafter, the scrutinizer shall return the register and other related papers to the company. The results declared along with the scrutinizer’s report shall be placed on the website of the company and on the website of the agency within two days of passing of the resolution at the relevant general meeting of members. Subject to receipt of sufficient votes, the resolution shall be deemed to be passed on the date of the relevant general meeting of members. Only 25% of payable additional fees. 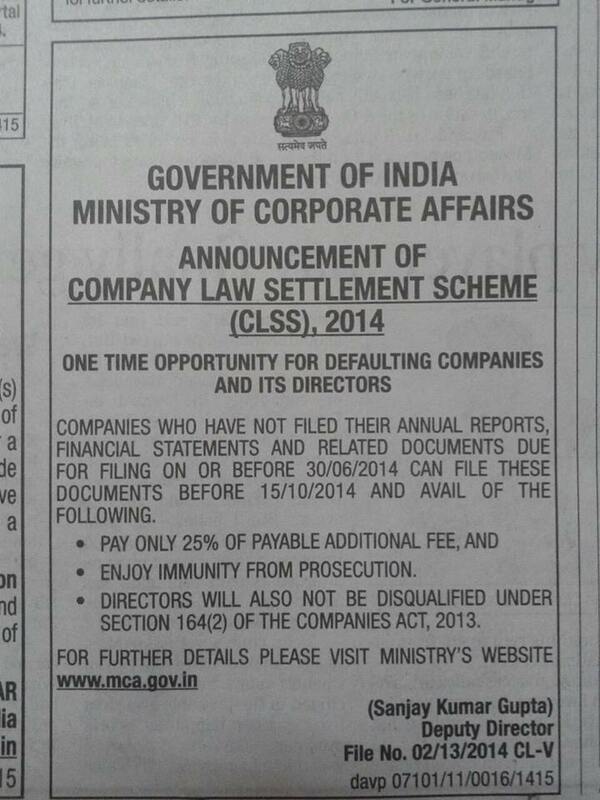 Director will not be disqualified under section 164(2) of the Companies, Act 2013. Companies can enjoy this scheme by filing their annual accounts before 15th October 2014. Don’t wait file all pending annual accounts and enjoy the benefits of scheme. This notification shall come into force on the date of its publication in the official gazette.